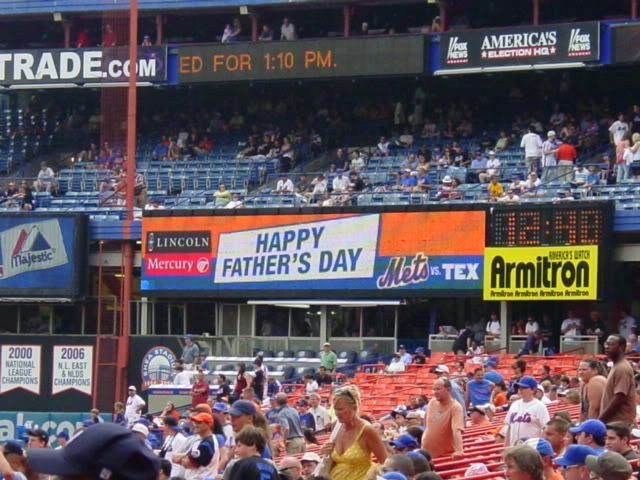 In what is quickly becoming a 'tradition' for us on the Mother's and Father's Day's, we found ourselves once again at Shea Stadium (yeah!!). 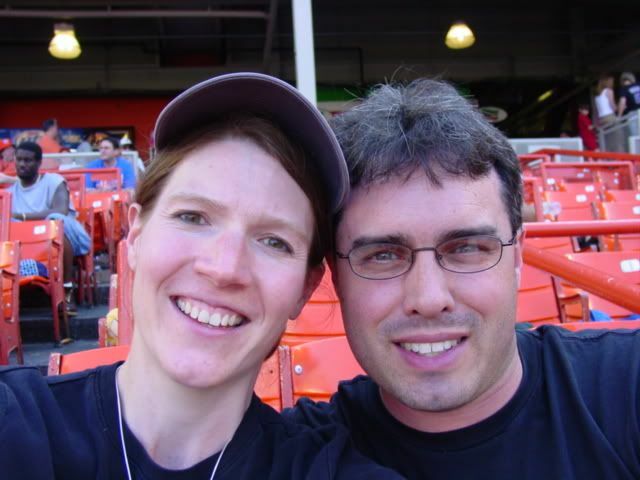 And this trip, I mean we were in the HEART of Shea Stadium! Not a 'zoomed' picture, this was the ACTUAL view from our seats! Jill hit a homerun on this Father's Day! I said all that I really wanted to do was go to a baseball game, and lo and behold Jill found that the Mets were home and then on top of that scored the best seats we have ever sat in for a major league game! We left on Sunday morning after I got out of work, leaving around 9:00 or so. We stopped once to put gas in the car (in PA since the prices in New York were a bit higher!). We pulled into the parking lot at Shea around 11:50 or so, and made our way into the stadium. We went straight for the main concourse with one mission in mind - Mama's of Corona! This little gem on the field level at Shea serves up some DE-LI-CIOUS sandwiches! On a previous trip (see the Flushing trip in May of this year) we also scored some sammies from here as well! We grabbed a couple of beers (in really cool souvenir type bottles) as well as some Nathan's fries (can't do without those!) and off to our seats we went (see the AWESOME view above!!). 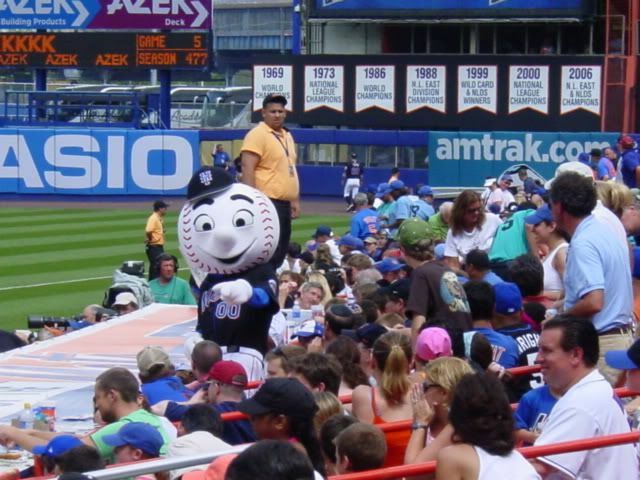 An added bonus for us on this day was the misfortune for many Mets fans the night before. A bad rain storm blew through New York on Saturday night, so that game was cancelled and rescheduled as part of a one ticket doubleheader on Sunday. Yep, that's right, two games for the price of one!! Can't beat that! Throughout both games, we ordered up some snacks from the waiters that serviced the area we were sitting in. By the fourth inning in the second game, the place had cleared out pretty much, with much of the field level, mezzanine, and upper reserved emptied out. Oddly enough, the loge section was still pretty full! We stuck it out through both games, and were rewarded with a Mets win in the second game of the two. After the game, we made our way back to Binghamton arriving home around 11:30. Holy crap! 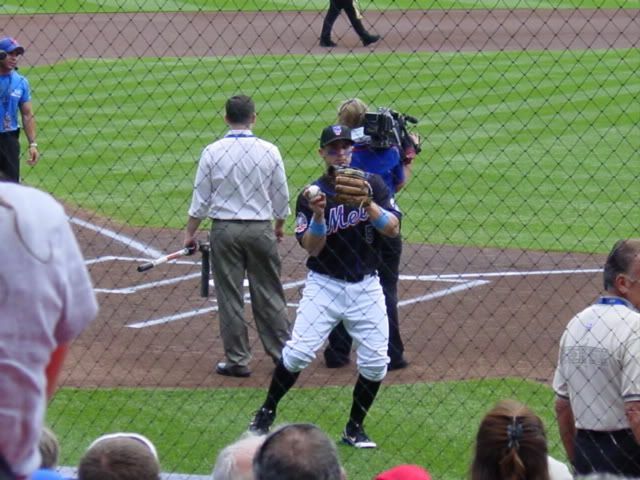 David Wright is looking right at us! I don't think there is any better Father's Day present in the world! Little did he know, this would be the last game Willie Randolph managed the New York Mets at Shea Stadium - he was fired the next day. NEW YORK -- The Mets' late-inning surge resulted in a tighter box score, but a six-run deficit compiled in the first 7 1/2 innings was too much to overcome, with New York falling to Texas in Game 1 of Sunday's doubleheader, 8-7. The Mets added three runs in the eighth and two in the ninth, but ended up leaving a total of 10 runners on base throughout the game. With the bases loaded in the eighth, and the lead cut to 8-5, Brian Schneider tagged up on a Jose Reyes popup and was thrown out at home plate to spoil a bases-loaded opportunity. "It's not my job to go out there and analyze," Schneider said. "I am told to tag up and I do what I'm told. ... You never want to get thrown out in that situation. That's not my intent to run to just get thrown out. I'm going with the intent to score." Starter John Maine gave up five earned runs and was yanked after 6 1/3 innings, but two of those runs were driven in with him on the bench. Reliever Pedro Feliciano gave up a two-run single to Ramon Vazquez. Feliciano and Joe Smith each were responsible for an earned run in the seventh inning, pushing the Rangers' lead to 7-2. Carlos Delgado and Carlos Beltran each had solo homers that traveled in excess of 425 feet early on, but the Rangers never relinquished the lead they gained from an Ian Kinsler grounder that snuck under the glove of shortstop Jose Reyes and brought Gerald Laird around to score in the third inning. 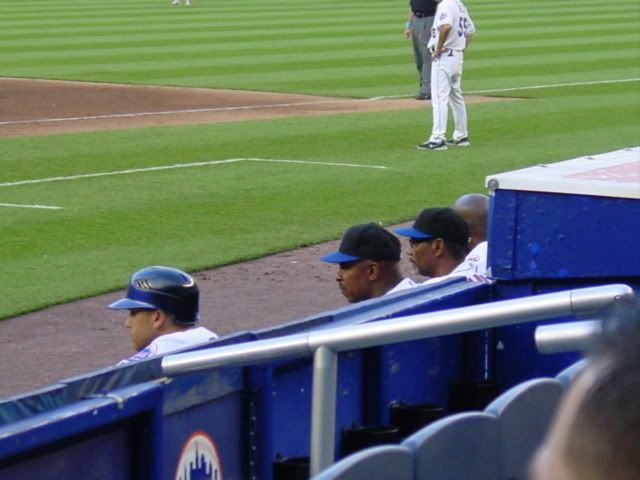 "When you are not playing well, it's frustrating," Mets manager Willie Randolph said. "But we can't get frustrated now. We've got another game to go." Jon Blau is an associate reporter for MLB.com. This story was not subject to the approval of Major League Baseball or its clubs. NEW YORK -- As statements go, this one was neither strong nor compelling, and not particularly convincing either. The Mets handled the Rangers in the second game of their Interleague doubleheader on Sunday, winning, 4-2, not as a means of saving manager Willie Randolph from speculation, but as a step toward saving themselves. After losing the first game, 8-7, in an unsightly manner, they won methodically with Pedro Martinez, Billy Wagner, David Wright and, of all people, Robinson Cancel doing the heavy lifting. If there was a statement to be made, they left it to others to make it; indeed, Wagner suggested it now is incumbent on the club ownership, Fred and or Jeff Wilpon, to do the talking, and say what must be said, one way or the other. "Ownership has to step up," Wagner said. "For the good of the team, they have to say Willie's the manager or he's not. Let's make a decision. No one is better off the way it is now." It was a fish-or-cut-bait moment in the Mets' clubhouse, some 20 minutes before this tired 33-35 team left for LaGuardia and its third "out West" trip in less than a month. Fatigue is a legitimate issue for the Mets and has been for weeks. Weary as they are, they are more tired of the uncertainty that surrounds their manager. "We'd be better off if this whole thing was put to bed," Wright said. Randolph's job security wasn't necessarily in the forefront of the Mets' composite mind as they engaged the Rangers in a makeup doubleheader that seemed so similar to something from the Joe Torre era at Shea, replete with many empty seats, less than brilliant execution and games that lacked character. A Sunday doubleheader is a piece of nostalgia now. Where have you gone Kevin Kobel? But whether it was carried by the media -- Carlos Beltran suggested the issue was created by the media -- or it was in the players' thinking through osmosis, a sense of "Where are you going Willie Randolph?" did exist. When one player saw the manager dressed in suit and tie after the second game, he concluded, "I guess Willie's making the trip ... after all." And he added this footnote: "Good." The players seemed mostly apolitical though. "Just make a decision," said Wagner, putting muscle in his candor. "Don't keep him dangling. It's not fair to him, his family or the players." Before they showered and dressed, the Mets had sent mixed messages to their owners, losing Game 1, despite a late demonstration of resistance and then winning Game 2. They have been getting the same sort of messages from ownership and their general manager. The situation became no clearer when Omar Minaya said he was unsure if he was making the trip to Anaheim, then indicated he was. "We are not performing to our fullest potential," said Minaya. "So I would like to leave room to evaluate the manager day-to-day." "That's the stuff that feeds this," Wagner said. "It should be just about trying to win, not trying to save someone. I mean it would be wrong to let Willie go. I hope that doesn't happen. But if that's what's going to be, let's get there. I can't be out there thinking, 'Oh gee, if I don't [save] this one, Willie's going to lose his job?'" "It would be great to hear one way or the other," Wright chimed in. "'Willie's our manager till the end of the season,' or, 'He's not.'" Wright doesn't hold the manager responsible either. 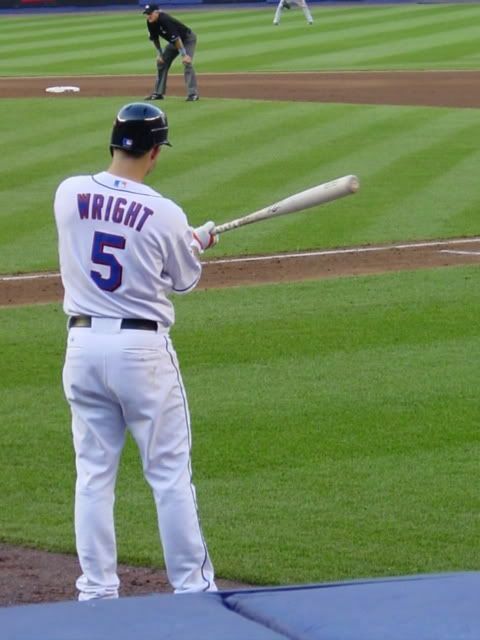 "I hope he's here for a long time," Wright said. But he tried not to think "save Willie" during his at-bats and while at third base. "We have to win ... to win, not to save his job," Wright said. "That's how Willie sees it too." Meanwhile, Randolph perseveres and tries to moves forward through the murky water. "I don't know what people around me are thinking," he said. "I assume I'll be here for a long time. That's my goal. "This is a big game to get." But was the significance he mentioned about the team, too? Uncertainty is everywhere. If the Mets had his job security in mind in the first game and played as they did for the first 7 1/2 innings in Game 1, what must Randolph have thought? "It would have been great to come out and play crisp and clean right from the start, but we didn't," Wright said. But Wright thought the Mets' attempted comeback in the eighth and ninth innings -- they scored three and two runs respectively -- bled into their second-game performance. Carlos Delgado's defense and a play not made -- no error was charged -- by Jose Reyes led to the Rangers' first run in the third inning of the first game. Losing pitcher John Maine surrendered a two-run homer to Ramon Vazquez, the No. 8 hitter, in the fifth. In the seventh, Maine's final inning, Pedro Feliciano put inherited runners on second and third with a wild pitch and then allowed a two-run single. Joe Smith, in the seventh, and Scott Schoeneweis, in the eighth, allowed home runs. So the Mets' late rallies proved inadequate. They might have scored more than three runs in the eighth, but third-base coach Sandy Alomar unwisely had slow-footed Brian Schneider try to score on a bases-loaded, one-out fly ball hit by Jose Reyes that right fielder Milton Bradley caught after moving in. Schneider was out by a wide margin and later said, "I do what I'm told." "It wasn't a good send," said Randolph. "And Alomar contended it took a perfect throw." The Mets won the second game behind Martinez, who after pitching six innings, was removed for the pinch-hitter, Cancel, who delivered the decisive runs. Chants of "We want Pedro" were heard as Cancel made his way to the plate. Martinez already had thrown 92 pitches and had one more inning, tops, in his 2008 Shea debut. Randolph was all but forced to use a pinch-hitter when the Rangers deliberately walked Fernando Tatis to load the bases. Cancel was the last right-handed bat available against left-hander Kason Gabbard. "I like the way Cancel makes contact and adjustments," Randolph said. Cancel's hit, a two-out bouncer, was his first big league hit since 1999 -- he had one other at-bat this season. "I don't remember. It's been a while," Cancel said. It followed a leadoff single by Beltran, a double by Damion Easley, a groundout by Delgado, a strikeout by Ramon Castro and the intentional walk to Tatis. "I feel like I put the ball in play a lot," Cancel said. "I kind of wear the pitcher out." "It found its way through the middle," Randolph said. "It's the kind of break we haven't been getting for a while. Maybe things are going to change for us now." He'd like to be around to see if they do. Marty Noble is a reporter for MLB.com. This story was not subject to the approval of Major League Baseball or its clubs. 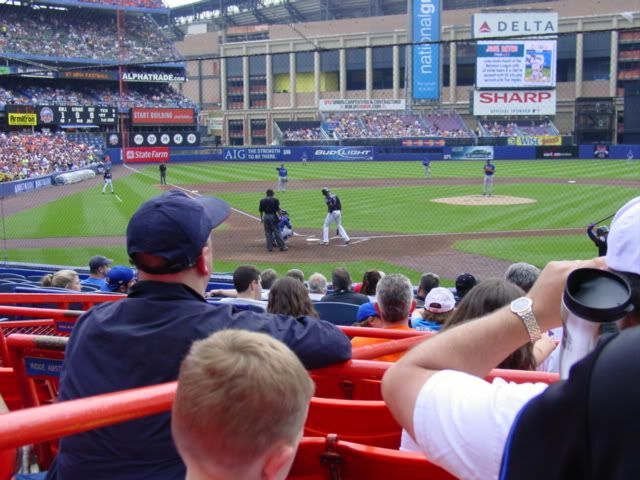 Our seats for the Mets games were Field Box, Row 5D, Seats 1-.